Happy Friday! This week our featured guest is Isadora from World by Isa. She’s sharing with us of her recent travel trips – what she learned, some of her favorite memories, as well as advice for future travellers. Continue reading to find out where she went, and what she has to say! Hey guys, my name is Isadora and I’m the voice behind World By Isa. I was always passionate about different countries and cultures, so when I finally graduated I decided to quit my job and start traveling. After coming back home, my friends started to ask me to share my experiences and tips with them (although I still consider myself pretty noob), as they too dreamed about travelling, and that’s why I created World By Isa. Well, I just came back from Peru, I made a trip through both, Peru and Bolivia, where I visited a BUNCH of cities! 5. Why did you travel to Peru and Bolivia? 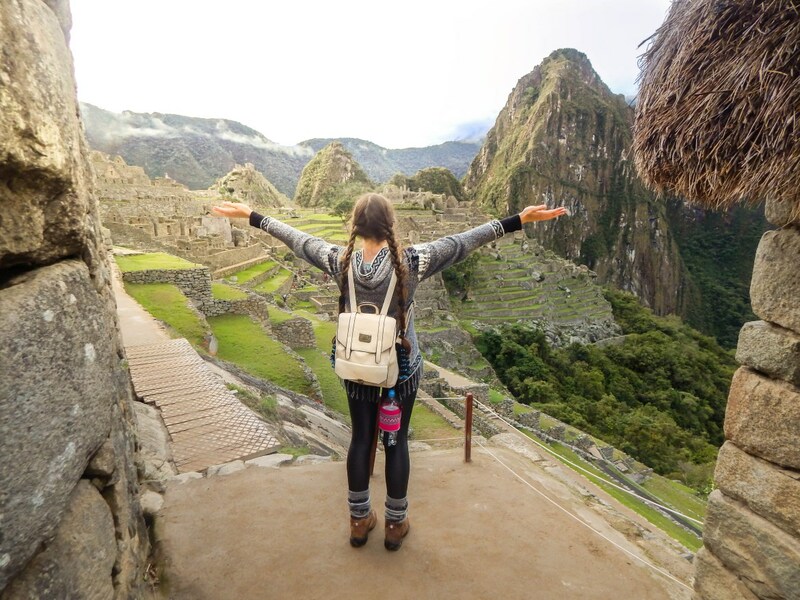 Well, although I’m South American, I realised I haven’t travelled much in the continent and decided to give it a try, I have heard so much about Peru specially, and as I love history and culture I thought it would be a perfect destination for me. Turned out that I managed to include Bolivia in the trip too, after being contacted by a company there. Definitely Ceviche! I already loved ceviche before going to Peru, but the original, traditional, Peruvian one is definitely amazing, and different from what I am used to, they have many different kinds of ceviches. Definitely Cuy, not because of the flavor itself but because of the look of the plate. It gives mixed feelings to look at the poor dead guinea pig there. Peruvian tuk-tuk, I didn’t even know it existed in Peru, but after using it I wondered why it is not a worldwide thing. It is cheap and so convenient! It depends on which city, Peru has many different weathers and landscapes. Lima was cloudy, as it normally is. In the desert area it was super sunny while in Cusco it was hot and humid. Bolivia on the other hand was sunny and dry, but it wasn’t hot or cold, it was something in between. 10. Where was your favorite place to in either country? Why? Well, of course Machu Picchu is the top 1 in the list but I don’t want to be predictable here hahahah. The main square in Arequipa is a place that I never get tired off going, that charming architecture and those stunning vulcanos behind the Cathedral really worth your admiration. While in Bolivia, Copacabana really won my heart, I love the vibe of that city, it is so calm yet everything is colorful and fun. 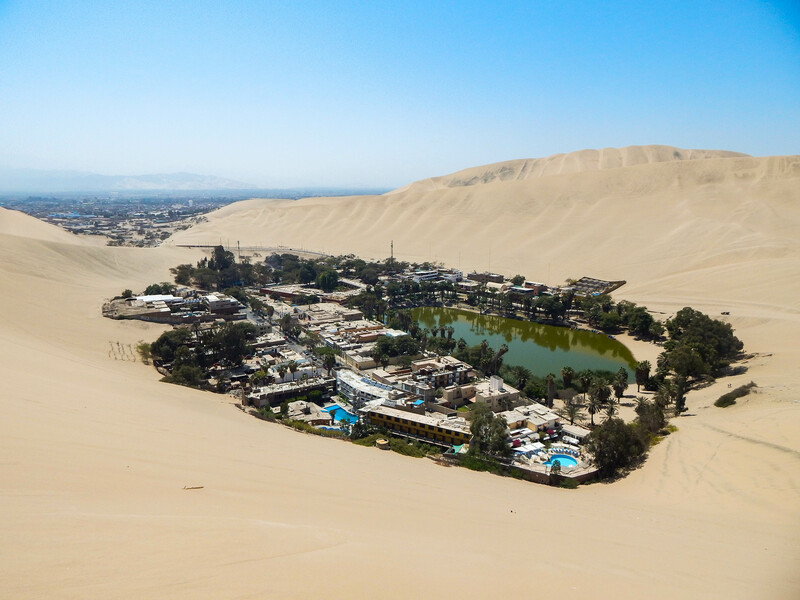 Trying sandboard in Huacachina with a whole audience watching and cheering for me! Well, I realised I’m a shame doing sandboard hahaha but I can’t wait to try again! I would probably be doing it wrong if I haven’t learn at least one thing or two, and to be honest, Peru and Bolivia really teach you life lessons. From new Spanish words to cultural and historical facts. But definitely the most valuable lessons I learnt was about kindness, hospitality and humbleness, which both people are experts in! 13. What was the best part of your trip? It is so hard to pick favorite parts in it. 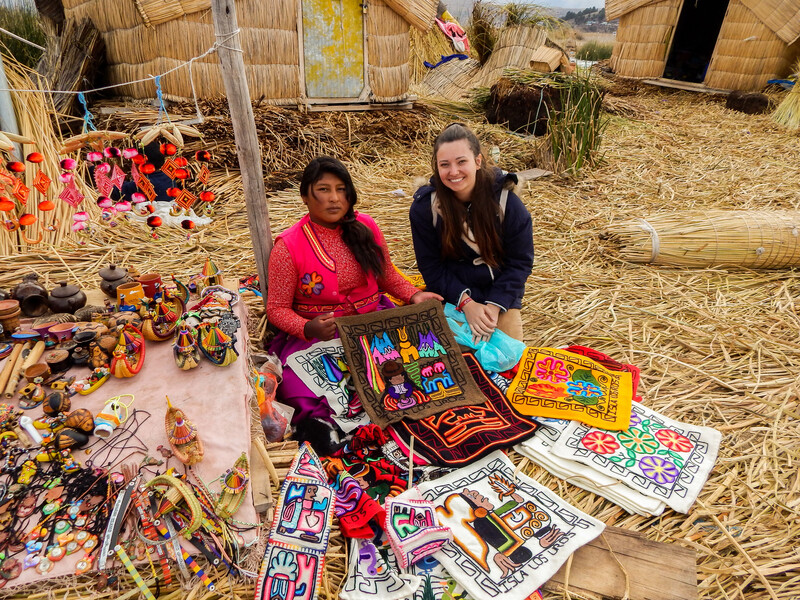 I loved so many things but a really unforgettable experience was visiting the people living in the floating islands in Titicaca lake. 14. What was the most challenging part of your trip? Facing the altitude sickness for sure hahaha I thought it was a popular myth, trust me guys, it is not! 15. How do Peru and Bolivia compare to your home country, Brazil? Were your expectations met, or did they differ completely? I wasn’t expecting that those countries would be so different of mine, although we are close to each other, it is completely different! Also I wasn’t expecting that Peru would have so many different and beautiful places, after all the country is so small! 16. 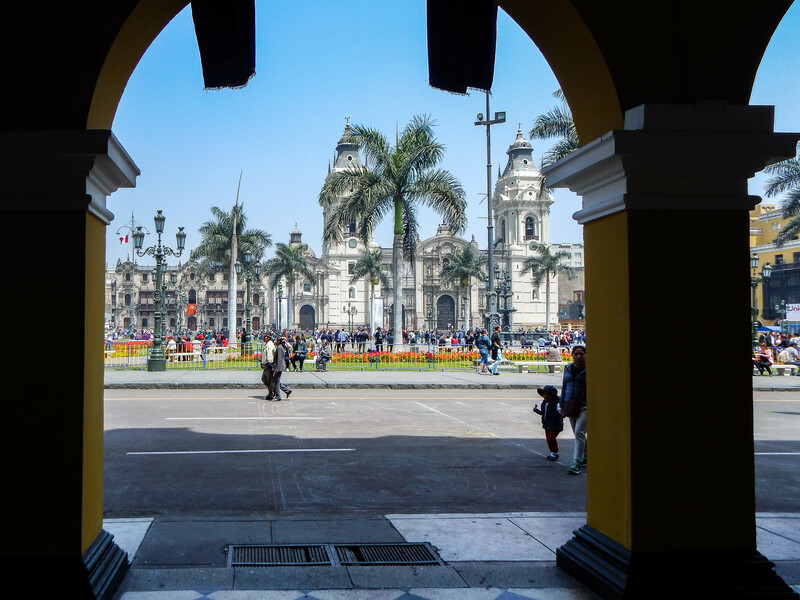 If you were to go to Peru and Bolivia again, what would you do differently? Although I did so many things, if I were to go there again (and I hope I do, at some point) I would try to hike Rainbow Mountain, this is something I didn’t manage to do and I regret not doing! 17. If someone else were to go to Peru or Bolivia, what advice or tips would you give them? Altitude sickness is real, so brace yourself, if you are going to a high city, make sure to pick at least the first day of the trip to rest and get used to the altitude. Drink A LOT of water and take the coca tea as often as you can. 18. Anything else you want to share about your trip? Guys, if you ever get the chance, go to Peru, you will have experiences that you will never have anywhere else in the world! It is full of surprises in every corner of that country! 19. Do you have any more travel plans lined up? Where to next? I’m planning to go to Europe during the European summer next year but still not sure what countries I will be visiting. Thank you so much Isadora for sharing your trip with us! I have heard so many great things about Peru, and now you’ve piqued my interest in Bolivia as well. I’ve definitely heard of how altitude sickness is no joke. When I eventually make my way over there, I’ll make sure to take your recommendation on getting adjusting to the altitude and drinking water as well as the tea before going on any excursions. Did you enjoy what you read? 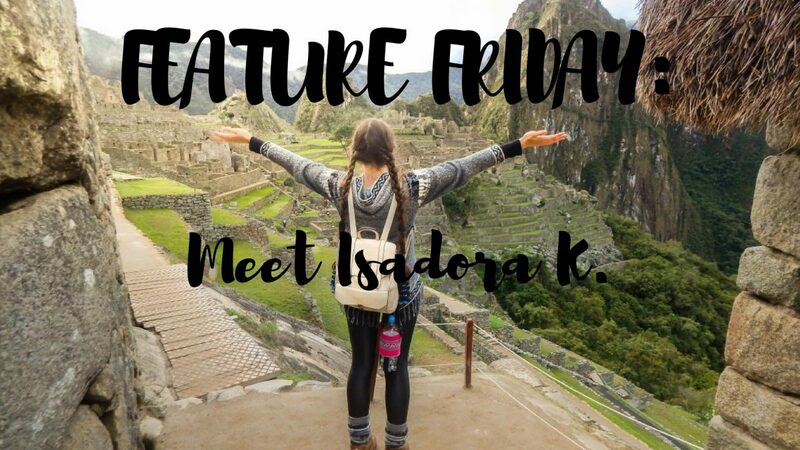 Get to know more about Isadora! Previous Previous post: Feature Friday: Meet Jasmine C.
Next Next post: Feature Friday: Meet Kay H.